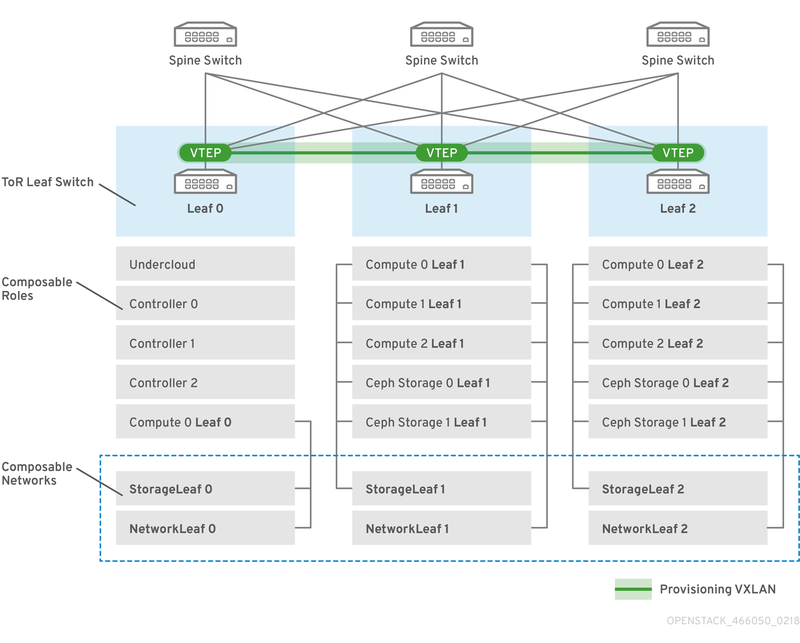 This guide provides information of how to construct a spine-leaf network topology for your Red Hat OpenStack Platform environment. This includes a full end-to-end scenario and example files to help replicate a more extensive network topology within your own environment. The StorageLeaf networks are presented to the Ceph storage and Compute nodes. The NetworkLeaf represents an example of any network you might want to compose. The routed spine-leaf bare metal environment has one or more layer 3 capable switches, which route traffic between the isolated VLANs in the separate layer 2 broadcast domains. The intention of this design is to isolate the traffic according to function. For example, if the controller nodes host an API on the Internal API network, when a compute node accesses the API it should use its own version of the Internal API network. For this routing to work, you need routes that force traffic destined for the Internal API network to use the required interface. This can be configured using supernet routes. For example, if you use 172.18.0.0/24 as the Internal API network for the controller nodes, you can use 172.18.1.0/24 for the second Internal API network, and 172.18.2.0/24 for the third, and so on. As a result, you can have a route pointing to the larger 172.18.0.0/16 supernet that uses the gateway IP on the local Internal API network for each role in each layer 2 domain. The network infrastructure must have routing configured to enable traffic between the different layer-2 segments. This can be statically or dynamically configured. Each layer-2 segment not local to the undercloud must provide dhcp-relay. You must forward DHCP requests to the undercloud on the provisioning network segment where the undercloud is connected. The undercloud uses two DHCP servers. One for baremetal node introspection, and another for deploying overcloud nodes. Make sure to read DHCP relay configuration to understand the requirements when configuring dhcp-relay. Some roles, such as the Controller role, use virtual IP addresses and clustering. The mechanism behind this functionality requires layer-2 network connectivity between these nodes. These nodes are all be placed within the same leaf. Similar restrictions apply to Networker nodes. The network service implements highly-available default paths in the network using Virtual Router Redundancy Protocol (VRRP). Since VRRP uses a virtual router IP address, you must connect master and backup nodes to the same L2 network segment. When using tenant or provider networks with VLAN segmentation, you must share the particular VLANs between all Networker and Compute nodes. It is possible to configure the network service with multiple sets of Networker nodes. Each set share routes for their networks, and VRRP would provide highly-available default paths within each set of Networker nodes. In such configuration all Networker nodes sharing networks must be on the same L2 network segment. 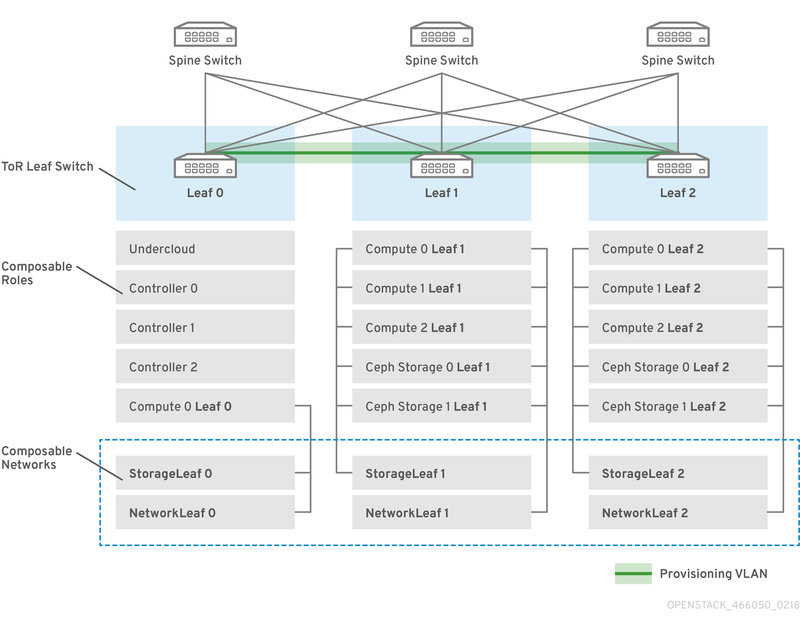 This section describes a use case on how to configure the undercloud to accommodate routed spine-leaf with composable networks. To configure the provisioning networks for your spine leaf infrastructure, edit the undercloud.conf file and set the relevant parameters as defined in the following procedure. This creates three subnets on the provisioning network / control plane. 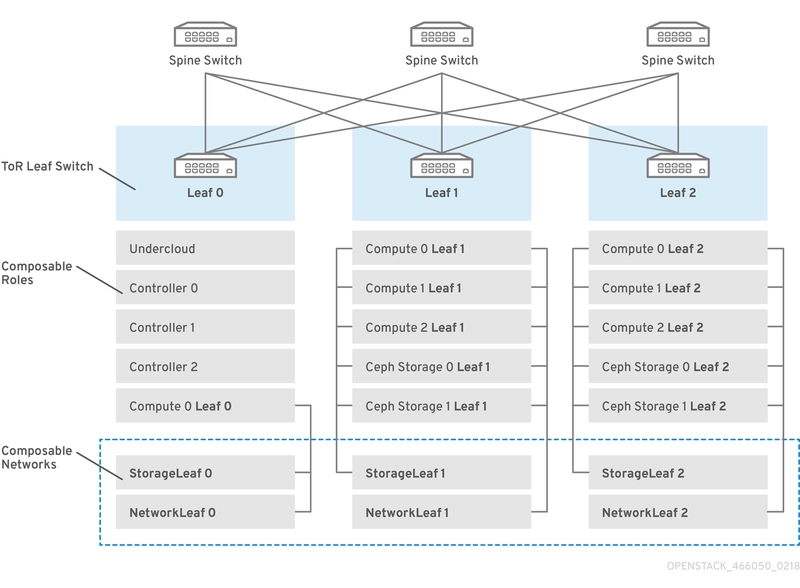 The overcloud uses each network to provision systems within each respective leaf. To ensure proper relay of DHCP requests to the undercloud, you might need to configure a DHCP relay. The next section provides some information on how to configure a DHCP relay. When configuring a DHCP relay make sure to forward DHCP requests to both DHCP servers on the undercloud. You can use UDP broadcast with devices that support it to relay DHCP requests to the L2 network segment where the undercloud provisioning network is connected. Alternatively you can use UDP unicast which relays DHCP requests to specific IP addresses. Configuration of DHCP relay on specific devices types is beyond the scope of this document. As a reference, this document provides a DHCP relay configuration example using the implementation in ISC DHCP software is available below. Please refer to manual page dhcrelay(8) for further details on how to use this implementation. Specifying an interface connected to the L2 network segment where the DHCP requests are relayed. Specifying the network address of the IP network where the DHCP request are relayed. This method relays DHCP requests using UDP unicast traffic to specific DHCP servers. When using UDP unicast, you must configure the device providing DHCP relay to relay DHCP requests to both the IP address assigned to the interface used for introspection on the undercloud and the IP address of the network namespace created by the OpenStack Networking (neutron) service to host the DHCP service for the ctlplane network. The interface used for introspection is the one defined as inspection_interface in undercloud.conf. It is common to use the br-ctlplane interface for introspection. The IP address defined as local_ip in undercloud.conf is on the br-ctlplane interface. $ openstack port list --device-owner network:dhcp -c "Fixed IP Addresses"
Interfaces to relay incoming DHCP request: eth1, eth2, and eth3. Interface the undercloud DHCP servers on the network segment are connected to: eth0. The DHCP server used for introspection is listening on IP address: `192.168.10.1. The DHCP server used for provisioning is listening on IP address 192.168.10.10. Configure a VLAN to use for our provisioning network. Add the the IP address of the leaf. Forward UDP and BOOTP requests to the introspection DHCP server listening on IP address: 192.168.10.1. Forward UDP and BOOTP requests to the provisioning DHCP server listening on IP address 192.168.10.10. Now that you have configured the provisioning network, you can configure the remaining overcloud leaf networks. You accomplish this with a series of configuration files. Each role in each leaf network requires a flavor and role assignment so you can tag nodes into their respective leaf. This procedure shows how to create each flavor and assign them to a role. $ ROLES="control0 compute_leaf0 compute_leaf1 compute_leaf2 ceph-storage_leaf0 ceph-storage_leaf1 ceph-storage_leaf2"
You can also set the number of nodes to deploy in the overcloud using each respective *Count` parameter. To enable deployment onto a L3 routed network the bare metal ports must have its physical_network field configured. Each baremetal port is associated with a bare metal node in the OpenStack Bare Metal (ironic) service. The physical network names are the ones used in the subnets option in the undercloud configuration. The physical network name of the subnet specified as local_subnet in undercloud.conf is special. It is always named ctlplane. This section contains information about other methods to configure the provisioning network to accommodate routed spine-leaf with composable networks. In this example, the director deploys new overcloud nodes through the provisioning network and uses a VLAN tunnel across the layer 3 topology (see Figure 3.1, “VLAN provisioning network topology”). This allows the director’s DHCP servers to send DHCPOFFER broadcasts to any leaf. To establish this tunnel, trunk a VLAN between the Top-of-Rack (ToR) leaf switches. In this diagram, the StorageLeaf networks are presented to the Ceph storage and Compute nodes; the NetworkLeaf represents an example of any network you may want to compose. In this example, the director deploys new overcloud nodes are deployed through the provisioning network and uses a VXLAN tunnel to span across the layer 3 topology (see Figure 3.2, “VXLAN provisioning network topology”). This allows the director’s DHCP servers to send DHCPOFFER broadcasts to any leaf. To establish this tunnel, configure VXLAN endpoints on the Top-of-Rack (ToR) leaf switches. Now that you have configured the undercloud, you can configure the remaining overcloud leaf networks. You accomplish this with a series of configuration files. Afterwards, you deploy the overcloud and the resulting deployment has multiple sets of networks with routing available. To define the leaf networks, you create a network data file, which contain a YAML formatted list of each composable network and its attributes. The default network data is located on the undercloud at /usr/share/openstack-tripleo-heat-templates/network_data.yaml. You do not define the Control Plane networks in the network data file since the undercloud has already created these networks. However, you need to manually set the parameters so that the overcloud can configure its NICs accordingly. Define vip: true for the networks that contain the Controller-based services. In this example, InternalApi0 contains these services. See Appendix A, Example network_data file for a full example with all composable networks. This section demonstrates how to define each composable role for each leaf and attach the composable networks to each respective role. This creates a full roles_data_spine_leaf.yaml file that includes all the custom roles for each respective leaf network. See Appendix C, Example roles_data file for a full example of this file. Each role has its own NIC configuration. Before configuring the spine-leaf configuration, you need to create a base set of NIC templates to suit your current NIC configuration. Each role requires its own NIC configuration. Create a copy of the base set of NIC templates and modify them to suit your current NIC configuration. See "Custom network interface templates" in the Advanced Overcloud Customization guide for more information on customizing your NIC templates. The rendered template contains most of the content that is necessary to suit the spine-leaf configuration. However, some additional configuration changes are required. Follow this procedure to modify the YAML structure for Controller nodes on Leaf0. Edit the template for controller0.yaml. Note that the parameters used in this case are specific to Leaf0: ControlPlane0SubnetCidr, Leaf0EC2MetadataIp, and ControlPlane0DefaultRoute. Also note the use of the CIDR for Leaf0 on the provisioning network (192.168.10.0/24), which is used as a route. Add the routes for the VLAN structure for the following Controller networks: Storage, StorageMgmt, InternalApi, and Tenant. This procedure creates a YAML structure for Compute nodes on Leaf0, Leaf1, and Leaf2. Edit the template for compute0.yaml. Add a VLAN structure for the following Controller networks: Storage, InternalApi, and Tenant. Change the network configuration script from ../../scripts/run-os-net-config.sh to /usr/share/openstack-tripleo-heat-templates/network/scripts/run-os-net-config.sh. Modifying the control plane / provisioning interface to use the Leaf1 parameters. Modifying each VLAN to include the Leaf1 routes. Save this file when complete. Modify the control plane / provisioning interface to use the Leaf2 parameters. Modifying each VLAN to include the Leaf2 routes. This procedure creates a YAML structure for Ceph Storage nodes on Leaf0, Leaf1, and Leaf2. Add a VLAN structure for the following Controller networks: Storage, StorageMgmt. Modify the control plane / provisioning interface to use the Leaf1 parameters. Modify each VLAN to include the Leaf1 routes. Modify each VLAN to include the Leaf2 routes. This procedure creates a basic network environment file for use later. Create a network-environment.yaml file in your stack user’s templates directory. The resource_registry will map networking resources to their respective NIC templates. The parameter_defaults will define additional networking parameters relevant to your configuration. The next couple of sections add details to your network environment file to configure certain aspects of the spine leaf architecture. Once complete, you include this file with your openstack overcloud deploy command. This procedure maps the relevant resources for network configurations to their respective NIC templates. Each role requires routes on each isolated network, pointing to the other subnets used for the same function. So when a Compute1 node contacts a controller on the InternalApi VIP, the traffic should target the InternalApi1 interface through the InternalApi1 gateway. As a result, the return traffic from the controller to the InternalApi1 network should go through the InternalApi network gateway. The supernet routes apply to all isolated networks on each role to avoid sending traffic through the default gateway, which by default is the Control Plane network on non-controllers, and the External network on the controllers. You need to configure these routes on the isolated networks because Red Hat Enterprise Linux by default implements strict reverse path filtering on inbound traffic. If an API is listening on the Internal API interface and a request comes in to that API, it only accepts the request if the return path route is on the Internal API interface. If the server is listening on the Internal API network but the return path to the client is through the Control Plane, then the server drops the requests due to the reverse path filter. This following diagram shows an attempt to route traffic through the control plane, which will not succeed. The return route from the router to the controller node does not match the interface where the VIP is listening, so the packet is dropped. 192.168.24.0/24 is directly connected to the controller, so it is considered local to the Control Plane network. This procedure defines the routing for the leaf networks. Add the following ExtraConfig settings to the parameter_defaults section to address routing for specific components on Compute and Ceph Storage nodes. The ServiceNetMap parameter uses a set of HostnameResolveNetwork parameters that provides each node in a leaf with list of hostnames to resolve other nodes in the respective leaf. 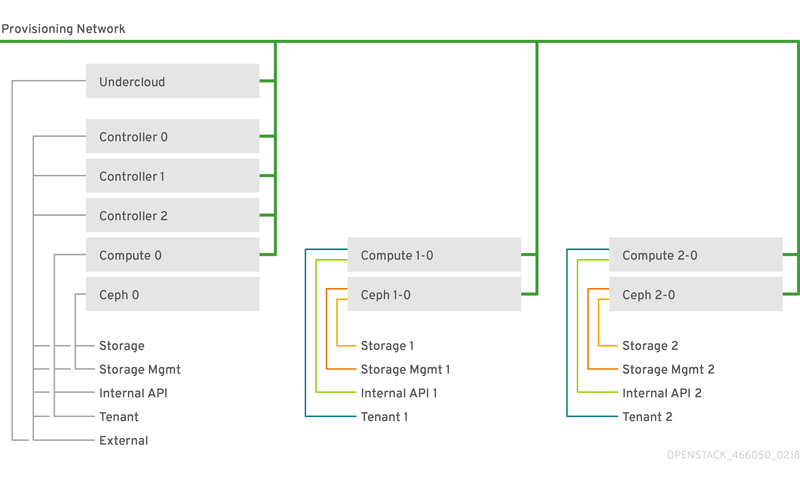 The Compute node use the leaf’s Internal API network and the Ceph Storage nodes use the leaf’s Storage network. nova::compute::libvirt::vncserver_listen is the IP address that the VNC servers listen. nova::compute::vncserver_proxyclient_address is the IP address for the server running the VNC proxy client. neutron::agents::ml2::ovs::local_ip is the IP address for OpenStack Networking (neutron) tunnel endpoints. cold_migration_ssh_inbound_addr is the local IP address for cold migration SSH connections. live_migration_ssh_inbound_addr is the local IP address for live migration SSH connections. nova::migration::libvirt::live_migration_inbound_addr is the IP address used for live migration traffic. nova::my_ip is the IP of the hosts Compute (nova) service. tripleo::profile::base::database::mysql::client::mysql_client_bind_address is the IP address of the database client. In this case, it is the mysql client on the Compute nodes. The public_network setting lists all the storage networks that contain Ceph nodes (one per leaf). The cluster_network entries lists the storage management networks that contain Ceph nodes (one per leaf). In this instance, we need to define the IP, subnet, metadata IP, and default route for the respective Control Plane network on Leaf 0. The default route parameters are typically the IP address set for the gateway of each provisioning subnet. Refer to your undercloud.conf file for this information. These act as routes through the control plane for the EC2 metadata service (169.254.169.254/32) and you should typically set these to the respective gateway for each leaf on the provisioning network. Review the /home/stack/template/network_data_spine_leaf.yaml file and ensure it contains each network for each leaf. There is currently no validation performed for the network subnet and allocation_pools values. Be certain you have defined these consistently and there is no conflict with existing networks. Review the NIC templates contained in ~/templates/spine-leaf-nics/ and ensure the interfaces for each role on each leaf are correctly defined. Review the network-environment.yaml environment file and ensure it contains all custom parameters that fall outside control of the network data file. This includes routes, control plane parameters, and a resource_registry section that references the custom NIC templates for each role. Review the /home/stack/templates/roles_data_spine_leaf.yaml values and ensure you have defined a role for each leaf. Check the `/home/stack/templates/nodes_data.yaml file and ensure all roles have an assigned flavor and a node count. Check also that all nodes for each leaf are correctly tagged. The network-isolation.yaml is the rendered name of the Jinja2 file in the same location (network-isolation.j2.yaml). Include this file to ensure the director isolates each networks to its correct leaf. This ensures the networks are created dynamically during the overcloud creation process. Include the network-environment.yaml file after the network-isolation.yaml and other network-based environment files. This ensures any parameters and resources defined within network-environment.yaml override the same parameters and resources previously defined in other environment files. Add any additional environment files. For example, an environment file with your container image locations or Ceph cluster configuration. Wait until the spine-leaf enabled overcloud deploys. The following is a template to get you started with the configuring the network interface templates for spine leaf networking. Note that the resources section is incomplete and requires your interface definitions.